The Enterprise picks up untrustworthy entrepreneur Harry Mudd accompanied by three beautiful women who immediately put a spell on all the male crew members. Lt. Cmdr. Leonard 'Bones' McCoy, M.D. : Are you wearing some unusual kind of perfume or something radioactive, my dear? Ruth Bonaventure: No, I'm just me. 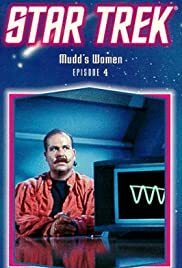 I can see what was risky about 'Mudd's Women' back in the '60s, but at the risk of betraying immaturity, it's the superficial aspects of this episode that grabbed me. For one, Harry Mudd's a fun character and I look forward to seeing him again (I hear good things about 'I, Mudd'). Also, the focus on three super fine actresses; the eye candy runneth over. Plenty of mileage is gotten out of crew members going to pieces at the sight of a beautiful woman (not to mention Spock smirking at all of this). It's the last act that's a bit off, and that believe in yourself bit feels forced. But it's still an enjoyable episode, with a scoundrel for a (somewhat) foil and for the most part a suitably comic tone.